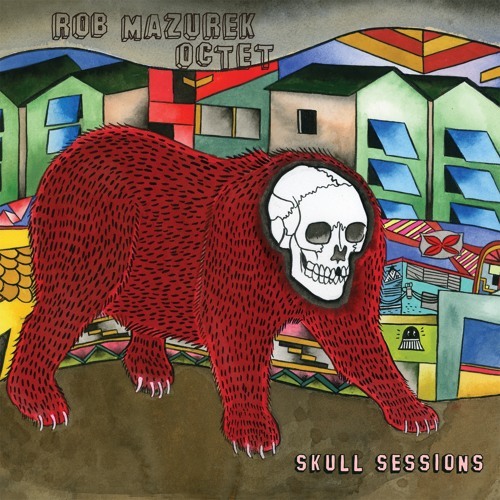 PURCHASE Rob Mazurek Octet - 'Skulls Sessions' (Cuneiform Records) @ AMAZON (digital & physical): http://www.amazon.com/Skull-Sessions-Rob-Mazurek-Octet/dp/B00AALHVEM/ ITUNES (digital): https://itunes.apple.com/us/album/skull-sessions/id592521732 BANDCAMP (hi-fi digital): http://cuneiformrecords.bandcamp.com/album/skull-sessions WAYSIDE (physical - ships worldwide): http://www.waysidemusic.com/Music-Departments/Mazurek-Eblast.aspx What does it sound like when worlds collide? For the protean cornetist, composer, and conceptualist Rob Mazurek, the fusion of his celebrated Exploding Star Orchestra with his roiling Brazilian ensemble São Paulo Underground ignites a beautiful cosmic burst. 'Skull Sessions', the first release by the newly minted Rob Mazurek Octet, captures a series of shimmering, enveloping jazz soundscapes. 'Skull Sessions' is composition and group improvisation as revelation, epic in scope, crackling with unexpected reactions and volatile collisions, charging the atmosphere like a thunderstorm that washes away all manner of sonic detritus. Cuneiform, the American label that also released Sao Paulo Underground’s most recent album, is releasing 'Skull Sessions' in CD format and as a limited-edition, high quality vinyl pressing of 250 copies, which includes a digital download card. A force on Chicago’s singularly inventive sound scene for two decades, Mazurek is an intrepid sonic explorer eager to investigate new configurations. From his variable Chicago Underground units (duo, trio, quartet, and orchestra) to the Exploding Star Orchestra, Starlicker and the Pulsar Quartet, he’s mastered a protean approach in which his collaborators give substance to a composition’s form by creating layers of sound. Lapidary and luxuriant, marked by an accretion of simultaneous lines and textures, 'Skull Sessions' features an international cast of masters from North and South America, including drummer John Herndon, vibraphonist Jason Adasiewicz, flutist Nicole Mitchell, Guilherme Granado on keyboards and electronics, Carlos Issa on guitar and electronics, Mauricio Takara on percussion and cavaquinho (Brazilian ukulele), and Thomas Rohrer on C melody saxophone and rabeca (a rustic Brazilian viola associated with the northeast). Rather than creating opportunities for solo expression, Mazurek’s music generates a forum for group discovery. “The soloist is not the main concern,” he explains. “The concern is personalities blending sound ideas that have the potential to expand or contract at any given moment in order to find the hidden spaces that must exist for the elevation and understanding of the origin of where we possibly come from and where we might be going.” The big bang that led to 'Skull Sessions' detonated when the We Want Miles exhibition at SESC (Serviço Social do Comércio) São Paulo requested that Mazurek devise a presentation related to his deep affinity for the music of Miles Davis. In characteristic fashion, he decided against recreating any of Davis’s music, instead composing new pieces and rearranging earlier works for the Octet’s particular personalities and unusual timbres.